Navratris are the 9 auspicious days when mother goddess or 'devima' is worshipped all over India under different names and manifestations. She is 'Shakti' ( strength) or the power of Brahma, Vishnu and Mahesh. She takes the form of their consorts, without her they cannot perform their duties. During Navratri mother goddess is worshipped in her 3 forms - as Saraswati, the white goddess, Parvati or Shiva's consort as Durga and Bhairavi, the black goddess. Saraswati is the goddess of all creative art and speech. She is the consort of Brahma, Lakshmi is the consort of Vishnu and is the goddess of fortune and the giver of peace of wealth. Parvati is the consort of Shiva and she is the most powerful and complex of all goddesses. Devi Puja or Navratris are performed twice a year for 9 days -once at the beginning of summer in March or April, ending on Ram Navmi (The birthday of Rama), The second time in September or October - during the nine days before Dussehra. 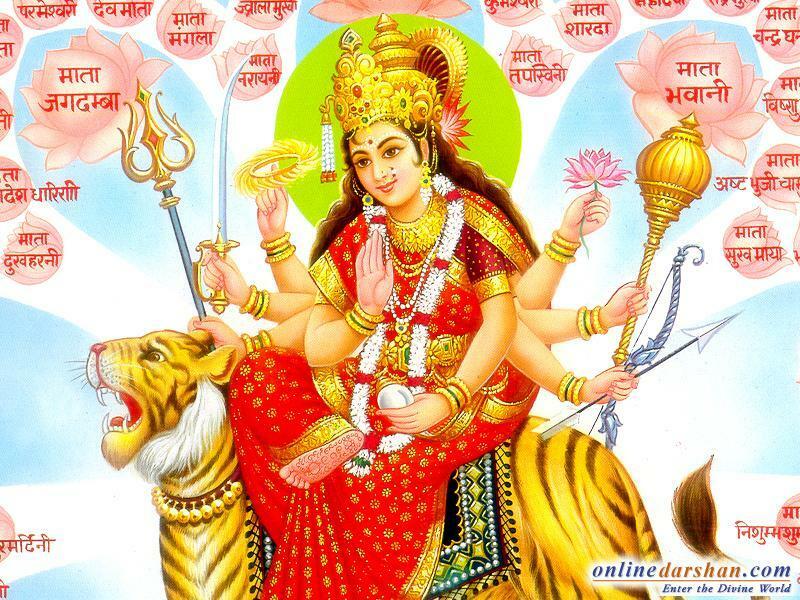 On both occasions the Navratris are celebrated during 15 moonlit days of the month. Summer Navratris are more or less a private family affair. Ashtami or the 8th day is very important. Young girls are regarded as 'devis' and are invited to many homes in the morning. As part of the celebration they are served puris, black channa and halwa. A small gift in the form of some money is also given, along with red bangles and a red scarf. Most of the people eat vegetarian food, some eat food without cereal in any form and some people fast for all the 8 days. People in the north very often visit the Vaishnodevi temple near Jammu during this period. Sometimes big lunches and dinners are also organised in temples or in community centres. Before the meals songs are sung in praise of the Mother Goddess. These are called "BHANDARAS"
In Gujarat and Bengal, Navratris are celebrated with great pomp and splendor. In these two states Winter Navratris are more of a community affair. In Gujarat at night time, young girls dressed up in ghagra cholis and boys in kurta pajamas gather together for the traditional 'Garbha Dance or Dandiya Rass'. In Bengal during Navratri, Goddess Durga, consort of Shiva is worshipped. This is their main festival. New clothes are bought, sweets are exchanged and most new purchases are made during this Festival. 'Pandals' are set up in each neighbourhood. The statue of Durga is placed here and the whole community joins in the prayers. Most of these pandals are beautiful, and a whole year can be spent planning how to build these. Musical evenings are organised in all the Pandals. On the last day of the Puja, the idol is taken with great fanfare and immersed in the river. In her mild form, Devima is the goddess of fertility or the harvest bride. In this form she is known as Gaura or Gauri Ma. In her fierce form she is known as Durga. She is shown riding a tiger, and as the slayer of demons. In her fiercest form she manifests herself as 'Kali'. So in this way our mother goddess is worshipped in her three forms as Lakshmi, Saraswati and Parvati all over the country. This year Navratri begins on 12th October and Dussehra will be celebrated on October 21th. May this Festive season bring Joy and Happiness to all of you.